Oct. 30, 2017 8:10 a.m.
Vancouver Whitecaps head coach Carl Robinson suggested in the leadup to Sunday that the first leg of the Western Conference semifinal with the Seattle Sounders might be a chess match. It turns out he was spot on. Vancouver and Seattle combined for just one shot on target in a scoreless draw where both teams were content to play cautiously and avoid the big mistake at B.C Place Stadium. Vancouver, which missed Major League Soccer’s playoffs by eight points last season, and Seattle, winners of the 2016 MLS Cup, will tangle in the second leg of the two-game aggregate series on Thursday at CenturyLink Field. A tie with scoring in Seattle will be enough for the Whitecaps to advance on the away goals rule, while another 0-0 draw would mean extra time. A Sounders victory by any margin will see them move on. The Whitecaps, who finished third in the West standings, were coming off the club’s first-ever playoff victory — a 5-0 demolition of the San Jose Earthquakes in Wednesday’s single-elimination knockout round. The Sounders, meanwhile, won three of their last four to close out the schedule, including a 3-0 home decision over Vancouver on Sept. 27, to grab second in the conference and secure a bye to the semis. The Whitecaps had to make two big changes to the starting lineup that thumped the Earthquakes, with crucial offensive pieces Yordy Reyna and Cristian Techera forced to the bench after picking up injuries against San Jose. Brek Shea and Nosa Igiebor, who only signed last month and made his second appearance, slotted into midfield alongside Christian Bolanos in support of striker Fredy Montero. The Sounders were without leading scorer Clint Dempsey after he was red carded in the club’s regular-season finale. 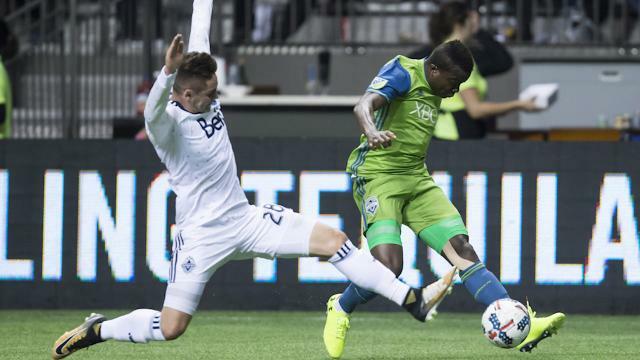 Seattle defender Chad Marshall rose to head the match’s one and only shot on target in the 48th minute, but Whitecaps goalkeeper Stefan Marinovic was there to make a comfortable save. Reyna subbed on in the 62nd minute to raucous applause before Techera joined the fray in the 76th, but their introductions did little to add any more attacking flair to a game that seemed destined to end 0-0 from the early stages. Things got heated in the 83rd minute with the Whitecaps clearly annoyed at what they viewed as time wasting by the Sounders, with Vancouver captain Kendall Waston in the middle of it. Robinson’s team has feasted on getting offence from set pieces this season, and the Welshman felt his team wasn’t given as many opportunities as it deserved from referee Kevin Stott. Seattle had the only real opportunity at a breakthrough in the 35th minute when Joevin Jones got in behind Nerwinski and fed a dangerous low cross that Waston rattled off his own crossbar on an attempted clearance for what was nearly a demoralizing own goal. The Whitecaps, who wound up a point behind Seattle in the standings, opened most of B.C. Place’s lower bowl, which pushed attendance to 27,837 and created an electric atmosphere that was helped by a strong contingent travelling Sounders supporters, who will be in full voice back home on Thursday night. “In front of their fans … it’s going to be a lot of pressure for us,” said Vancouver left back Marcel de Jong. “I like those moments, big games. It’s good for us. Notes: Dempsey is eligible to return for the second leg. … The Portland Timbers, ranked No. 1 in the West, visit the No. 4 Houston Dynamo in the first leg of the other conference semifinal on Monday.